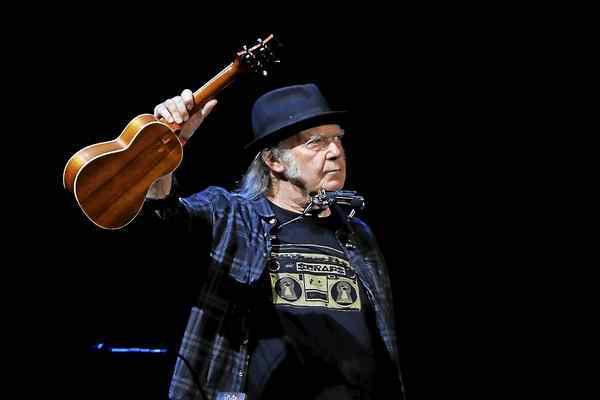 DETROIT -- Taking in the din of fan requests for particular songs on Tuesday night, July 3, at the Fox Theatre, Neil Young gave a wry smile and gently chided, "Keep calling for whatever you want. I never will play it." Fortunately, what the two-time Rock and Roll Hall of Famer did play during the 21-song, hour-and-45-minute solo show -- livestreamed via his Archives web site -- was more than good enough. Tuesday's performance was personal for Young. Detroit is one of only four stops he's playing solo this summer, spending the night on a stage surrounded by instruments -- acoustic and electric guitars, a banjo, harmonicas, three pianos and a pipe organ (and his usual cigar store Indian). Though he cracked at one point that "I'm not too clear on details" the 72-year-old Young had plenty of specific memories to share about his time in the Motor City, about playing at clubs such as the Chessmate -- and writing songs at a nearby White Castle, about recording for Motown at Hitsville U.S.A. with his band the Mynah Birds and about visiting fellow singer-songwriters Chuck and Joni Mitchell in town. He also remembered crashing in the basement of a young woman's house, only to have her parents come home and kick him out in the wee hours of the morning. That intimacy informed Young's performance, a heartfelt journey through the past and up to the present that started with Buffalo Springfield's "On The Way Home" and concluded with Young, on ukulele, singing "Tumbleweed" "for my sweetheart (actress Daryl Hannah) before I hit the road tonight." In between was stellar delivery of choice material during which Young -- sporting a plaid shirt, a black T-shirt with a boom box on the front and a black fedora -- took in all those aforementioned request and then played what he planned to all along, occasionally wandering around the stage as if pondering what should come next. While he began the evening with love songs -- "Homefires," "Only Love Can Break Your Heart," "Love Is A Rose," "Cowgirl In The Sand," "Mellow On My Mind" -- Young pivoted gently to the political throughout much of the show. He recalled writing "Ohio" in the wake of the 1970 Kent State University shootings before playing a biting version of the song on electric guitar. He referenced the current immigrant children separated from their families -- "A lot of people are looking at that..." -- before playing Buffalo Springfield's "I Am A Child" and let the music speak for itself on songs such as Springfield's "Broken Arrow" (played for the first time in more than 20 years), "After The Gold Rush," "Angry World," "Love And War" and "Peaceful Valley Boulevard." He even made a bit of a statement during the non-commentary "Are You Ready For The Country?," nodding pointedly when he sang the line "Are you ready for the country, because it's time to go." Other rarities included "There's A World," "Speakin' Out" and "Out On The Weekend," while an emotional "Tonight's The Night" on piano, "The Needle And The Damage Done" and "Heart Of Gold" touched on his top shelf of hits. "I just heard an echo of 1978," Young quipped when one fan shouted for "Powderfinger." "I'm glad you like all those songs. It's nice to be here with you." And no matter what he played, the feeling at the Fox was certainly mutual. This article has been viewed 501 times since being added on July 5, 2018.